A Honey of a Day! Honey is a natural, unrefined sweetener. Raw, unprocessed honey contains all of the beneficial vitamins, minerals enzymes and antioxidants that are not present in ‘grocery store’ honey. Honeys differ in color and taste depending on the blossoms visited by the honey bees. Honey does not spoil! Store honey at room temperature; never in the refrigerator. Consuming LOCAL honey can help people who suffer from seasonal allergies. PURE HONEY will granulate or become smooth and hard. Some kinds of honey will ‘candy’ more quickly than others, depending on the flowers from which they are gathered. Many people prefer honey in the granulated form, known as “honey butter”. If it is desired to restore the honey to its liquid state, place the container in a kettle of hot water and let it remain until the honey is fully liquefied. Be careful NOT to let the water boil…to overheat, boil or scorch the honey! Honey’s composition makes it an effective antimicrobial agent…aiding in the treatment of sore throats, burns and bacterial infections. Honey is a natural humectant ~ has the ability to attract & retain moisture. For natural beauty treatments, add honey to facial masks, bath oils, hair conditioners and home crafted soap! Honey may be used in recipes as a substitute for sugar: use about half as much honey as sugar called for, reduce the liquid by 1/4 cup, add 1/2 tsp. baking soda for every 1 cup of honey used. Lower the oven temp. 25 degrees to prevent over-browning. In colonial times, bee skeps were built of straw or grass to house a swarm of honeybees until the mid-1800’s. In fact, ‘skep’ means ‘basket’ in Old English. Some skeps were made of wicker and covered with a mixture of dirt and cow manure to keep the bees warm and protected from the weather. 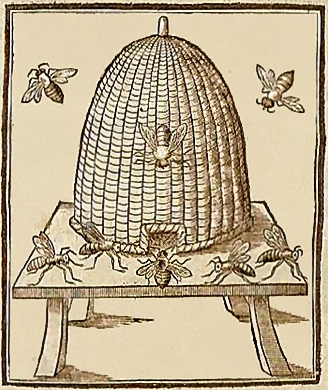 Early Americans often gave newlyweds a skep and swarm of honeybees as a symbolic wedding gift. Not only would the young couple have their own honey supply, but it was hoped that they would see the hard-working honeybees as a model of harmony and productivity for their own lives. Today, gardeners use a skep as a focal point in their garden and build a roof over it to keep off the rain. If kept dry, a skep will last for 30 years or more. Although still used to house honeybees in Europe, skeps are primarily a decorative item in the U.S.
Heat the honey GENTLY in a double boiler over a low flame. Place the herbs in a clean/sterile jar and pour warm honey over them; seal the jar & allow the herbs to ‘infuse’ their flavor into the honey at least 1 week. Strain herbs and re-bottle. HINT: Steep the honey glazed herbs in a cup of tea before tossing them onto the compost heap! As an alternative, add herbs directly to warm honey allowing it to steep until slightly cooled. Strain & transfer infused honey to a clean jar, carefully wiping the rim of the jar. No hot water bath needed! Add a bit of fabric and twine, a personalized label, recipe card, a bee charm or little clay tag! Flavored honey makes a thoughtful gift for a special friend! 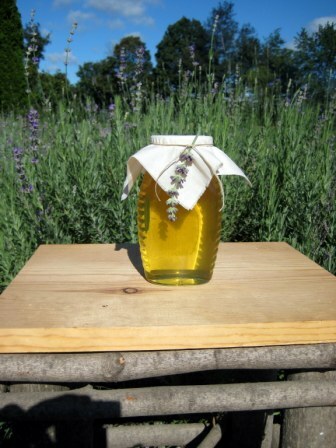 This entry was posted in Recipes and tagged herb infused honey, honey, lavender honey, natural by Sheepy Hollow Farm. Bookmark the permalink. great ideas! thank you so much for sharing. i can’t wait to try one or two ideas. Jenny – this is a wonderful article on honey, and I have to try your recipe. I’m getting some honey from a friend soon.